The first thing I noticed after installing Panda IS 2009 was the new graphic user interface (GUI). It has a brand new, fresh look that is much more streamlined than the 2008 version. With the improved look comes the same great user-intuitive feel that we found in Panda IS 2008 with a little better organization on the main console screen. I had no issues finding the utilities I was looking for and I have no doubt that a novice user would do just as well. Panda was paying attention to their user base. Installation was clean and simple. The entire process took roughly 8 minutes which is actually about one minute quicker than the 2008 install. I did not notice any kind of lag on the post-install Windows boot time so bonus points there. Like always, the setup phase completed with an initial system scan and software updates were downloaded and applied automatically. As stated in my introduction, the GUI for Panda IS 2009 is a huge improvement on what IS 2008 offered. While 2008 is just as functional, 2009 is simply more pleasing to look at with its streamlined feel and intuitive layout. The five-tabbed console makes locating utilities a breeze. The Status tab is split into three sections and gives a sort of statistical overview of system health. 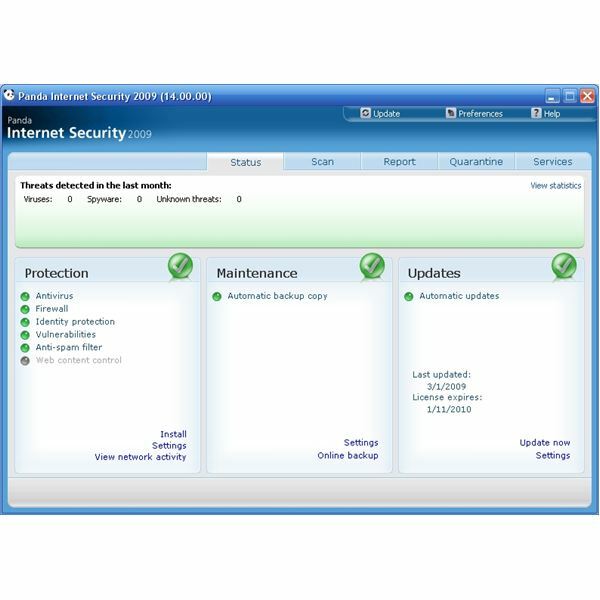 These sections are labeled Protection, Maintenance, and Updates and contain real-time stats on each. Displayed at the bottom of each section are settings and advanced options for custom configuration. The Scan tab offers a number of scan utilities for running checks on your drives, emails, or specific files and folders. This section offers a scheduling tool which is a must for any security software suite. 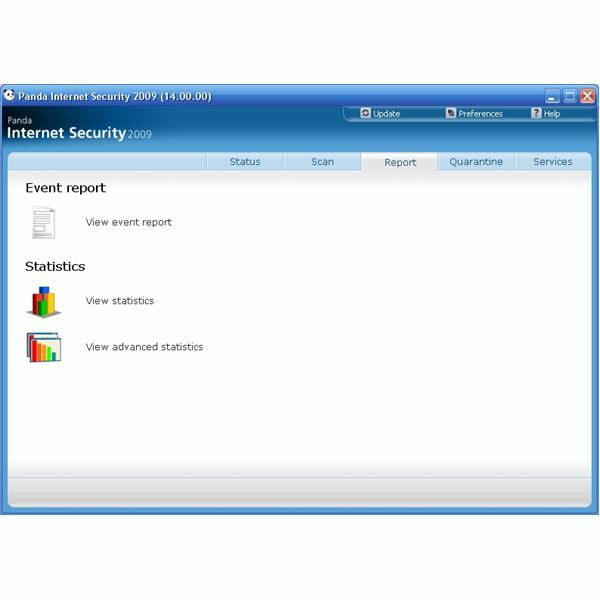 The Report tab allows you to run statistical data analysis to custom tweak your security configuration for optimum security and performance. The Quarantine tab shows items that were flagged as malicious and their current status. This section will also display important analytical data such as the original file location, the reason it was quarantined, and when this information was sent to Panda via their Collective Intelligence system. This system essentially "recruits" other Panda Security users from across the globe to provide Panda with real-time virus data that can be shared virtually. As threats are analyzed, in real-time, warnings can be sent to all Panda IS users and assist (or prevent) a large outbreak. The Services tab immediately caught my attention because one of my biggest pet peeves is having to search through a website for support. Panda offers every type of support (email support, recovery disk creation, bulletins, downloads, suggestions, etc.) all in one convenient location within the console. For my purposes this is more than sufficient but novice users could probably benefit from a technical support line and/or an online user forum. To put Panda IS 2009 through its paces, I ran a full system scan while watching streaming media via Hulu.com, updating iTunes, and burning a mix CD. I didn't notice any unusual resource spiking that could have been perceived as a result of the Panda software. Normal computing (i.e. mostly web surfing, gaming, and streaming video in my case) was virtually unaffected by the presence of Panda IS 2009. In fact, I would forget it was installed until I received a pop-up message that new definitions had been downloaded and successfully installed. That caliber of automation was a nice surprise. I feel most would consider this a fair pricing model considering the feature set included. However, I would still like to see a user forum and technical support phone number offered. Panda has struck a nice balance with this latest offering. 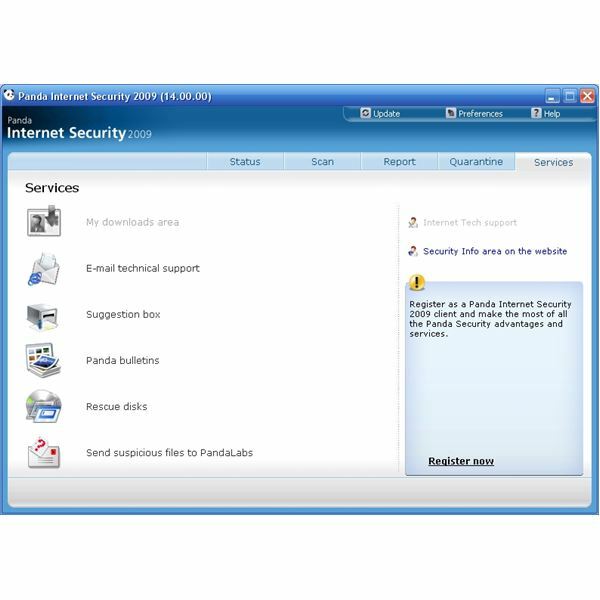 If you are looking for an internet security suite that does what it says it will, protect your computer(s) in the most non-intrusive manner, Panda Internet Security 2009 might be for you. Included is just about everything you need for maintaining malware-free systems without all the extra bells and whistles you might never use. Give it a try by downloading a free evaluation HERE. Would you like to read more reviews? Look around Bright Hub and you’ll find reviews of numerous other leading security solutions including SpamTitan, GFI MailEssentials, Atek Secure Password Organizer, GFI LANguard, Norton Internet Security, ESET Smart Security, McAfee Site Advisor, Norman Internet Security Suite and Undelete.